The BenQ PV3200PT is a color-accurate 4K monitor designed for video editors who require wider gamut capabilities. Just like any excellent prosumer product out there, this option comes with an array of features such as numerous picture presets and hardware calibration support. On paper, the BenQ PV3200PT looks like it already is a top-notcher, but seeing its capabilities in practice could be a whole other story. The company behind some of the best gaming displays we have seen spared no effort or detail with the BenQ PV3200PT and gave it a minimalist look with a subtle hint of elegance. The bezels are reasonably thin for a 32-incher, staying clear of obstructing the massive viewing space. We prefer the matte black texture of the exterior since it applies a clean, subdued look while helping avoid dust, fingerprints, or scuff marks. The bottom bezel is slightly thicker than the rest mainly due to the inbuilt sensors which detect ambient lighting for adjusting brightness, while the other checks if you leave the front so it can go to sleep. We have seen a similar feature on the BenQ EW2770QZ. While it could be useful to on power consumption, it might ruin your preferred fixed settings for the BenQ PV3200PT’s imaging quality. The base with a brushed black texture has a solid metal core under the plastic, so can provide sufficient footing to this heavyweight display. We absolutely love the aluminum neck with a cable tidy hole which swivels on a hinge while serving as the seat for the hot-key puck. This gadget is usually present on the company’s high-end offerings, and in our experience, it does have its uses and is convenient and easy to use. 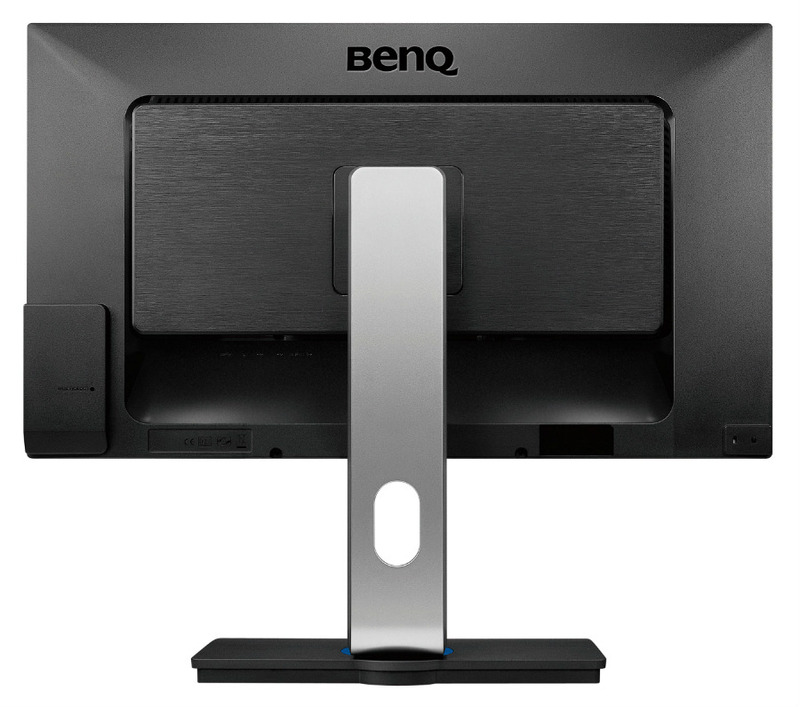 The ergonomics of the BenQ PV3200PT is superb, since it can raise the cabinet up to an additional 5.9 inches, plus it can tilt, swivel and pivot. The mechanism is completely removable, and upon doing so will reveal a 100 x 100 bolt pattern for VESA mounting. The BenQ PV3200PT’s rear panel is interesting because it has all the functional features in convenient orientations. For starters, the video inputs which include DisplayPort 1.2, a mini-DP 1.2, and HDMI are placed on the right of the rear bulge, making them readily available by swiveling the screen to the side. Near the edge of the right bezel, you can find the convenience hub which includes two USB 3.0 ports and the SD card reader. There are two more USB 2.0 slots on the layout for maximized usability, but what’s great about the BenQ PV3200PT’s physical implementation is despite the limited depth of the cabinet, it already includes an internal power brick. You don’t have to mess with a power cord, although using the wide array of I/O options might change that. 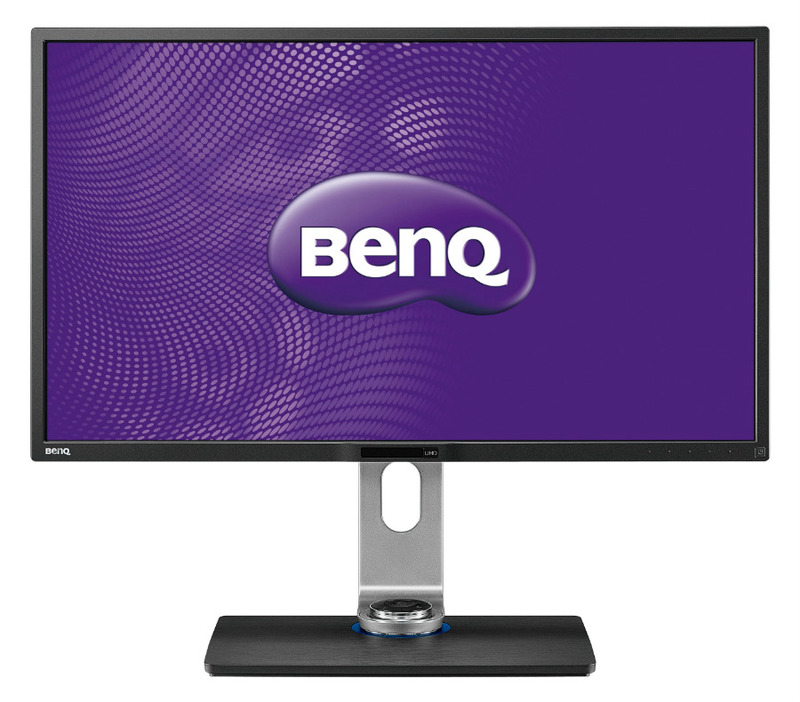 The BenQ PV3200PT features a 32-inch IPS panel with a 3840 x 2160 native resolution, 60Hz refresh rate, and 5ms response time. This module has a 10-bit interface with a 14-bit LUT, enabling the impressive color specifications the product is promising. Since this model is targeting the video post-processing professionals, it can reproduce 100% of the sRGB and Rec. 709 gamut standards. In tests, the BenQ PV3200PT is a top ranking choice thanks to Delta E scores of .80, while gamma sits at 2.3. Contrast is fantastic at 50 to 60% brightness since this model posts 1060:1 score which is consistent with high-quality monitors equipped with the best OEM panels. Only a few products in the market can compete with these scores, but it’s rare to find a video editing-specific option among them. There are numerous presets in the BenQ PV3200PT’s OSD, but it only includes three options for film standards. Curiously, DCI-P3 is missing from the list, but the product includes filters for PAL/SECAM and SMPTE-C, among the Rec 709 standard we mentioned earlier. Upon selecting these features, we did not see any immediate errors in saturation or tinting, but some slight deviations in greens and reds can be easily alleviated by tweaking the RGB temps. Adobe RGB coverage hovers near 70%, explaining why DCI-P3 isn’t doable with the BenQ PV3200PT. There are options out there from brands like NEC who carries all color options, but they are a tad more expensive plus unavailable for retail sales. We hope BenQ has a complete model in the works which could include the prototypical Rec. 2020, but we are getting too far ahead of ourselves. Screen uniformity is excellent for our review unit, and we only noticed a slight variance of 12% going to the side. There are some hotspots in the upper zone of the panel, but it was too little to be noticed by the naked eye. Colors remain constant as well, and apart from adjusting the brightness, there isn’t much you can do to improve the output drastically. Although we still encourage calibration depending on personal or company standards. The IPS panel’s 5ms response times in games isn’t that detrimental, but you will notice some blurring or interlacing in fast paced sequences. While the BenQ PV3200PT can still manage in some after-hours sessions, its 25ms input lag might turn-off serious gamers who rely on snappy responsiveness for smoother gaming experiences. You also can’t rely on FreeSync while gaming on the UHD resolution of the BenQ PV3200PT, so if your card has insufficient processing juice, for sure, the demanding titles we love will stutter. This is a minor complaint, however, since this device biases towards professional and business use. The BenQ PV3200PT is no doubt, an excellent professional display for users who are in the broadcast or film industry. The company’s factory calibration is spot on, and it creates an out of the box performance worthy of commendation. You almost can’t get anything this good regarding accuracy and vibrancy, but the more popular Adobe RGB and DCI-P3 standards could have given this model more mileage.